The Red Rooster Plate Rack displays two medium sized plates or three small plates. 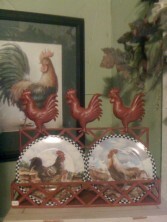 We also carry a nice selection of rooster plates starting at $8.95. Candles by Wendy are 100% Soy. Soy candles last three times longer than petroleum-based candles. They have an incredible scent throw with virtually no black soot. The following fabulous scents are available: Country Spice, Dogwood, Pumpkin Spice, Bird of Paradise, Tropical Nights, Creme Brulee and Hawaiian Plumeria. Christmas holiday scents are also available. 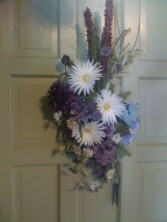 This custom wreath is the perfect addition to your French Country decor. 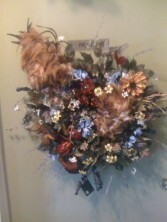 Designed in typical French Country colors, this wreath is highlighted by a rustic hued rooster and various pods. This is the perfect addition to your country kitchen decor. An adorable yet amusing chicken in a checkerboard design. 14 inches at the tail. 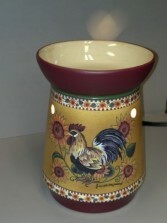 Show your rooster love in your office or library. A pair of very detailed Rooster themed bookends in an antique gold finish. Each bookend is 9 inches by 4 inches. This Contemporary Black Wire Rooster will add that unique look to your rooster collection. 11 inches by 11 inches at the tail. Rooster sign sold separately. 4 inch hen and rooster pair in a ceramic French blue glaze. We carry a nice assortment of unique crosses to add to your collection. Prices range from $8.95-$35.95.